Dog ear infections (also called otitis externa) are one of the most common canine health issues today. And they’re one of the most frustrating to deal with because they tend to come back, again and again. This may have a lot to do with how they’re treated … antibiotics can help, but they set your dog up for short term success only. In the long run, they’ll just cause more imbalance that will cause more ear infections in the future. 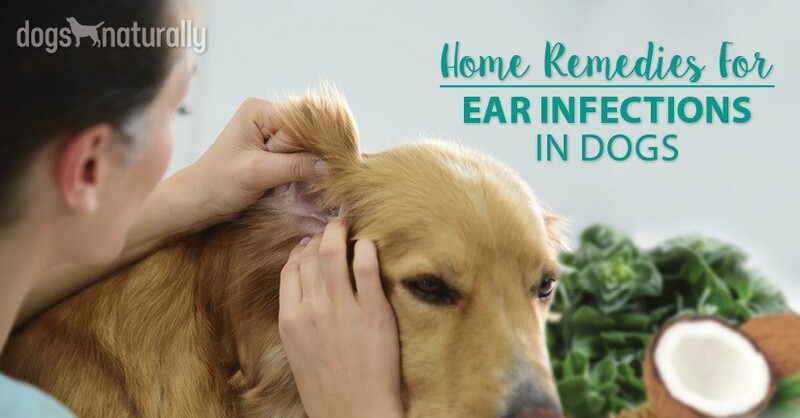 So let’s look at how to get to the bottom of those dirty ears … and we’ll share our top 5 natural remedies for dog ear infections. If your dog has unusual eye movements, is walking in circles or having trouble with his balance, it might be time to have him checked by the vet for a deeper infection. But most infections are in the outer ear only and can be treated at home. You might have heard that ear infections can be caused by long, floppy ears, swimming, moisture, dirt or hair in the ear canal. But there are many dogs with floppy ears that swim every day (like mine) that don’t get ear infections – it might increase the risk, but ear infections are rarely just ear infections … they’re often a sign of a much deeper problem. Bacteria that normally reside in your dog’s ear such as Staphylococcus can overgrow if the dog has a stressed immune system. This is definitely a consideration if the infections are recurring. Fungi are also normal inhabitants in your dog’s ear. They live together in harmony with bacteria in little colonies called the microbiome. Like bacteria, yeast can grow out of control if your dog’s immune system is functioning well or if he has leaky gut. More often than not, ear infections are the result of an immune dysfunction, such as allergies, hormone imbalances or hypothyroidism. One infection isn’t a cause for concern. Just use the natural remedies below to clean it and restore the balance in the microbiome. But if your dog suffers from repeated ear infections, you need to focus on his immune health or the infections will come back. Let’s look at the natural solutions for rebalancing the ear, then we’ll talk about how you can deal with repeated infections. These are our top 5 natural remedies, all tried and tested! The ingredients are inexpensive and easy to get … and best of all, they work! The acetic acid in vinegar can help remove dirt and debris from ears. But more importantly, it can kill both yeast and bacteria. But if your dog has red, sore ears, don’t use vinegar … it will be very painful for him. Use one of the other remedies instead. Take your apple cider vinegar and put it in a glass with equal parts distilled water. You can either put it in a syringe (you can pick one up at your local pharmacy) and squirt a little in your dog’s ear, or you can soak a cotton ball in the vinegar/water solution and gently clean your dog’s ear flap with the cotton ball. Note: Never use Q-tips in your dog’s ears! They can push dirt and bacteria further down into the ear or they can even rupture the eardrum. [RELATED] What are the 3 ways apple cider vinegar can help your dog? Click here to find out. Mullein is a plant that has antibacterial properties and it works great for bacterial ear infections. It might seem daunting to buy your own herbs and make your own recipes, but it’s quite easy. Pack mullein leaves and/or flowers in a glass jar and cover with olive oil. For increased antibiotic effectiveness, you can add a clove or two of antibacterial garlic (freshly chopped) per pint of oil. Strain and apply several drops of the warmed oil into the ear canal with a dropper or soak it on a cotton ball and apply to your dog’s ear. You can also buy an infused oil, already made. QUICK TIP: Find a natural remedy with mullein right here. Add one drop or oregano oil to ½ oz of pure aloe vera juice. Drop a small amount of the mixture into your dog’s ear or soak it in a cotton ball and swab the ear flap with it. Calendula has amazing healing abilities and it’s one of the best herbs for treating local skin and external ear problems. It can be used either internally or externally, and it’s a potent antifungal herb and it also offers pain relief. Pack calendula flowers in a glass jar and cover with olive oil. Add a clove or two of freshly chopped garlic. Make sure the leaves are fully covered with the oil and let the mixture sit for three to four days. Keep for up to 6 months. You can also buy a ready-made infusion. [RELATED] Calendula is great for helping with ear infections, wounds, immune support and more.Visit our article here. Coconut oil is both antibacterial and anti-fungal. And a study in “Dermatitis” in 2008 proved it to be an effective anti-fungal. Place 2 tablespoons coconut oil in a saucepan on low heat with two fresh garlic cloves for extra antibacterial power. Simmer until the oil is liquid then let it cool slightly (you don’t want the oil to be too warm for your dog’s ears). Use a dropper and place two to three drops in the affected ear. You can also dip a cotton ball in the mixture and use it to clean your dog’s ear. If your dog repeatedly suffers from ear infections, this is probably an immune system issue. Specifically highly processed, grain based foods containing wheat, rice, spelt and soy, food additives and preservatives; the lectin found in unsprouted grains; sugar, genetically modified foods (GMOs) and pasteurized dairy products. [RELATED] The most species appropriate diet is a raw one. Find out how to get started here. This includes the unnecessary use of steroids, non-steroidal anti-inflammatories (NSAIDs), deworming drugs, flea and tick treatments (many contain pesticides) and antibiotics (leading to an imbalance of healthy gut bacteria, also known as dysbiosis). Vaccination wreaks havoc on the immune system and can cause a number of autoimmune diseases like allergies. Chronic stress or boredom can also influence gut health. Stress negatively affects the immune and digestive systems. If your dog suffers from chronic ear infections, it’s time to improve his diet. Of course switching to a raw diet will solve the issue of too much carbohydrate in the diet and will help heal the leaky gut. Avoid drugs and chemicals whenever possible, including vaccines. The skin is the largest organ in the body, and ear infections are often a sign that something isn’t right in the body. Treating ear infections with antibiotics and steroids will only worsen the bacterial imbalance and the problem might move from the ears to the gut … creating immune dysfunction. So the next time your dog has an ear infection, try these herbal solutions and put an end to the unhealthy cycle of drugs and suppression. Natural treatments are always best and they will never harm your dog’s immune system.